NSIDC archives and distributes 1 km Level-1B Advanced Very High Resolution Radiometer (AVHRR) data as well as twice-daily 1.25 km, 5 km, and 25 km AVHRR EASE-Grid composite data products. As part of the NOAA/NASA Polar Pathfinder program, AVHRR EASE-Grid products are designed to provide scientists with a time series of global-scale remote sensing data for the period prior to the Earth Observing System (EOS) satellite launches. The AVHRR instrument is used for a wide range of applications in polar and climate research. 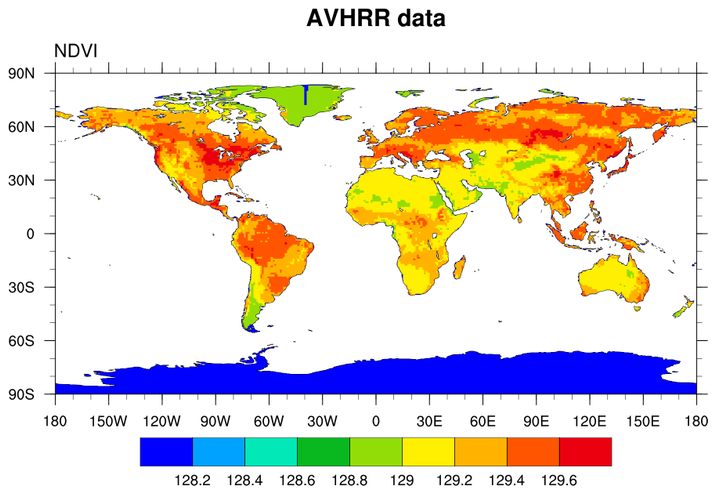 AVHRR data provide a global, long-term, consistent time series with high spectral and spatial resolution suitable for albedo and surface temperature measurements. Such measurements are necessary for studies involving climate, sea ice distribution and movement, and ice sheet coastal configuration. avhrr_1.ncl: An AVHRR plot from an hdf file. gsn_csm_contour_map is the plot interface that creates a contour map plot. It creates a cylindrical equidistant plot by default. Usually when we deal with netCDF or HDF data, there is coordinate information available. This data did not have either, so we had to guess.